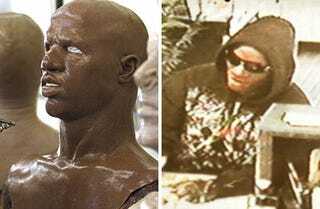 Last spring, a white Polish immigrant robbed several Ohio banks wearing a hyper-realistic Hollywood mask. To security cameras and witnesses, he looked like an undisguised black man. Which is why an innocent black guy was arrested for the crimes. When Conrad Zdzierak called Hollywood mask-making company SPFXMasks inquiring about a mask of a young African American man called "The Player" and a matching set of black hands, he said he was doing the research as a movie producer. He was actually doing the research as a bank robber. Zdzierak ordered the mask—the company's run from $600 to $1200—and donned it to commit a series of bank robberies in Ohio. Police acted quickly and mistakenly arrested a black man for the crimes. Six of seven eye witnesses identified the black man as the culprit in a lineup, and even the falsely accused man's mother thought it was her son when Police showed her a surveillance photo of the robber. That's a pretty effective disguise! The man was locked up until recently, when Zdzierak's girlfriend found the mask and a stash of money and contacted police. Recently, a Chinese man used one of SPFXMasks' products to sneak onto a plane disguised as an elderly white man, and Zdzierak's robberies are leading authorities to believe that Southern California's "Geezer Bandit," an elderly bank robber who has gone unapprehended for months, might not be so elderly after all.